Call for more information about commissions or gallery work. The Art Waddle in Boerne, Texas is a festive outdoor event held on neighborhood sidewalks and yards, and a fun, informal celebration of painting, sculpture, glassworks, etc. People stroll streets at their own pace, chatting with artists, making friends and enjoying the day, perhaps partaking of a refreshment offered by one of the artists. 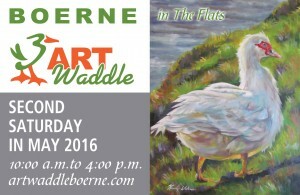 The Waddle is held in the “Flats,” Boerne’s funkiest neighborhood. Over the last decade the Flats has become a diverse, reinvigorated zone where modest older residences mingle with new and imaginative architecture. It’s a place for the creative side of Boerne. Named after the ducks that populate Boerne’s Cibolo Creek, the Art Waddle is organized by friends of the arts. All proceeds are donated to the Cibolo Nature Center and Farm’s Summer Art Camp. There is no admission fee to the Waddle, though waddlers are encouraged to contribute to the cause. Fill out the form to send a message.